When I tell people that I am a copyeditor and indexer, they usually have some idea of what an editor is (if not specifically a copyeditor), but they ask what an indexer is. I am not alone here; most indexers have the same problem. This series is about book indexes (print and ebooks), but there are also indexes for databases, websites, archives, and journals. An index is an alphabetized list of keywords with (usually) page numbers to guide the reader to the information in the book (whether that be a single-volume or multi-volume text). An index is usually at the back of a book, but for a multi-volume text, it may be in a separate volume. What an index is not is a concordance. An index does not list every occurrence of every name or word in the text. If you are an author or editor looking to hire an indexer, it helps if you are all speaking the same language. Here are some basic terms that will pop up in a conversation about your index. Indexers use locator rather than page number. While the locators are page numbers in most books, in a multivolume work, locators are volume and page numbers. Locators might be numbered sections or paragraphs in a reference book, map and grid numbers in an atlas, or product numbers in a catalog. Locator can also refer to a range to indicate that the topic is discussed on adjacent pages; thus, 23–25 indicates that a discussion is on three pages but is one locator. A string is three or more locators for the same main entry or subentry. One of the first questions an indexer will ask you is whether you want your index to be run-in or indented. This refers to how the subentries are arranged relative to the main entry. Run-in indexes are usually found in scholarly books where a lot of details are indexed. They take up less space, but are harder to scan with the eye. Indented indexes, which are easier to scan, are usually found in trade and children’s books. Each box contains one entry. This entry has the main entry, tomb(s), followed by 11 subentries. Each subentry is followed by one or more locators. I have labeled the string of four locators after plundering, and the page range after in Tura. The subentry Montemhet has a gloss (TT 34) that further identifies the tomb as Theban Tomb 34. In this case the gloss was given in the text by the author. Indexers occasionally add glosses where clarification is needed — for example, to differentiate between two people with the same name. This one entry has 11 subentries and 20 locators — each page or page range is a locator. In my indexing file, there are 20 records for this one entry, one record for each locator. It is important to understand this meaning of entry because in some types of indexes, the indexer is paid by the number of entries (rather than by the more usual page count or word count). If that were the case here, I would consider the text in the illustration to be 20 entries, not one, and the client and I probably would disagree. If you are writing or commissioning an index that will be paid by the number of entries, make sure that the two parties fully understand and agree on what an entry is before work begins. An indexer will also ask you how many levels of subheads you will allow. The publishers I work for most often allow only one level, as shown in the above example, but occasionally they allow two. Some kinds of specialized indexing require many levels of subheads. The number of levels affects how the information is organized. If there are more than a given number of locators in a string (usually five to seven), it is best to differentiate them by creating subheads. A long string of locators is next to useless for the reader. Some publishers are strict about limiting the number of locators in a string, and this must be communicated to the indexer at the beginning of the project. Sometimes publishers do not leave an adequate number of pages for the index so there is insufficient space for subheads. This is often seen in trade books, but unfortunately it is becoming more common in scholarly books. If space is short, the indexer will have to create longer strings of undifferentiated locators. The two most common types of cross references in indexes are See and See also. Indexers use See cross references when there is more than one term for a concept, or more than one name for a person. These tell the readers which word to look up to find the information. In this example, readers who go to Arab Spring are told to go to Revolution of 2011, which is the term the author uses. 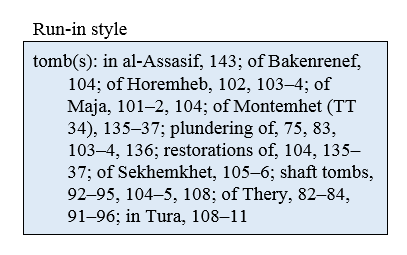 Indexers use See also cross references to guide the readers to other topics related to the current one. In this example, page 115 explains how the misnomer “solar boat” came to be used. Under Khufu Boat Museum, readers will find more information about the boat itself and its preservation. See also cross references can go before or after the locators. As the author, you must communicate that preference to the indexer. One more term to understand is double post. If there is more than one term for a concept (so that a See cross-reference would be expected for one of them) and only a very few locators for it, indexers might list the locators under both terms rather than using a See cross-reference. This is considered good practice because the reader does not have to flip from one page to another, and it might actually take less space to print the locators than the other term. In this example, the double post does, in fact, take less space than the See cross reference. Indexers also use double posting to create multiple access points for the reader. All or some of the names and terms that are subentries in one place become their own main entries elsewhere. This is called breaking out and is good practice. In the first example in this essay, all of the subentries become main entries elsewhere. 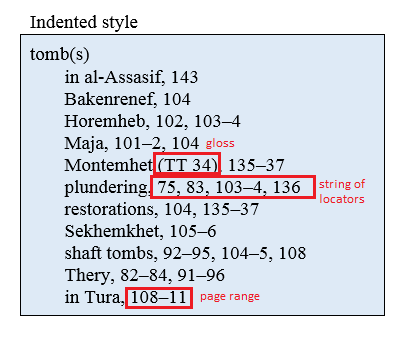 Note that plundering and restorations have their own subentries, and Tura has an additional locator that is not related to tombs and thus did not appear when Tura was a subentry under tomb(s). If space is limited, indexers use less double posting. 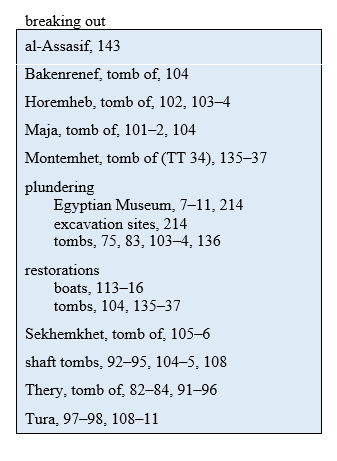 For example, if space were limited in this case, I would make separate entries for the tombs of Bakenrenef, Horemheb, Maja, Montemhet (TT 34), Sekhemkhet, and Thery, but not include them as subentries under tombs. I would add See also tombs of individuals under their names. You now have some basic vocabulary so you can communicate with an indexer about your book. In other segments, I explain how we create indexes (Hint: We don’t use magic wands, and the computer does not do it for us) and what you can expect in an index. Thank you for this; very informative. Looking forward to the next segment. Thank you. I’m glad it was useful. Will you also cover what kind of training is needed to become an indexer? If not, what would you suggest? I might cover that in the distant future. In the meantime, the University of California Berkeley Extension program (https://extension.berkeley.edu/), the Society of indexers (https://www.indexers.org.uk/), and the American Society for Indexing (https://www.asindexing.org/) all have online courses. I’m not a professional editor of any kind, but I read a lot and use indexes. I noticed something that you have not mentioned, but which perhaps should be explicit in a basic introduction such as this one, even though it seems as though it should be obvious. In your illustration of run-in style, the leading prepositions “in” and “of” are ignored for purposes of alphabetization. The leading prepositions are ignored in this instance, as you point out. Alphabetizing has other “rules,” however. Maybe alphabetization is a subject for a future posting. Maybe. Thanks for the suggestion, D’Ann. You are correct that they are ignored. I am not aiming to teach indexing but to help authors and editors understand the indexing process to be able to communicate with indexers.